Thou Shalt Not Kill… Except or Stryker’s War started its life as a 50-minute 8mm short film starring Bruce Campbell and Sam Rami. Director Josh Becker pitched the idea for the short and collaborated on the story with Campbell as they were driving back from finishing filming on The Evil Dead. Josh hoped to copy what Rami had done with Within the Woods and use the short to Pitch Stryker’s War as a full-length 35mm theatrical feature. Unfortunately Josh couldn’t raise the necessary funding, but decided to shoot the film on 16mm for a mere $20,000 anyway. With Campbell having just gone SAG and Josh having to go non-union due to budgetary reasons, he could no longer afford Campbell to reprise his role in the lead. But Josh did happen to get the Rami brothers, Sam and Ted, with Sam reprising his role of the hammy Manson-esque cult leader from the short. Knowing the film was written originally written for Campbell makes a lot of sense when you watch it. His presence would have been the only thing that could have balanced Rami’s performance, which was very over the top and seemed as if he was channeling a demon from The Evil Dead. Thou Shalt Not Kill… Except is an extremely low budget film about a group of Vietnam vets who after fighting, come home and take on a Manson family type cult who are terrorizing their small town. The film is like a 70’s exploitation film, filmed in the late 80s. 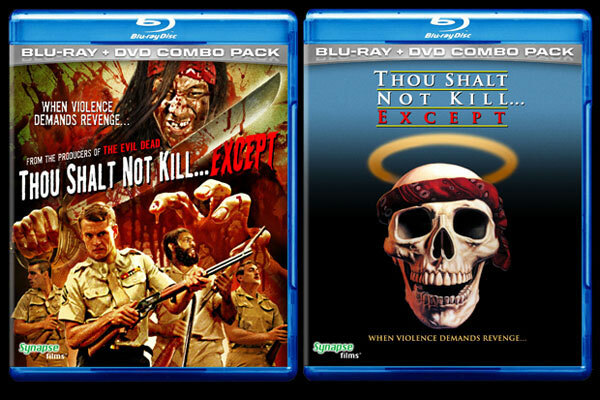 Thou Shalt Not Kill… Except is not a great film, but thanks to its numerous ties to The Evil Dead the film has a cult following and was recently released by the great folks over at Synapse in an extras packed DVD+Blu-ray combopack. The film is presented in an anamorphic 1:66 widescreen. The transfer is pretty damn good considering it was sourced from 16mm. The transfer is very crisp at points and the colors are very vibrant, with the grain that you would expect from 16mm lovingly preserved. One of the reasons I am such a fan of Synapse is they care about preserving the look of film digitally and don’t DNR the hell out of their releases, and the fact that they got the 16mm to look this good is pretty amazing. The film does tend to get a bit blurry in a few scenes. At first I thought it was my projector’s focus, but it turns out hard focus was not one of the cameraman’s strong suits. This happens intermittently throughout the entire picture and while this isn’t super apparent on the DVD on the Blu-ray it’s a bit more noticeable. The audio mix is a fairly dynamic DTS HD stereo track. While the dialog of most of the actors is very clear and legible, Sam Rami’s seems like it was re-dubbed after the fact. But you can tell much like the film the audio was definitely cleaned up for the release and makes for a good presentation. Like most of Synapse’s releases the film is packed to the gills with extras and here is the real meat and potatoes of this release. There is a great 30 minute featurette on the making on Thou Shalt Not Kill… Except with a bunch of great interviews with the cast and crew, except of course Campbell and Sam Rami; which seem to be absent on most of these special editions. Those interviewed really give some great insight into the making of the picture, funding it and eventually marketing it. The reason most folks will probably pick up this disc is as an extra it includes the original 8mm 50 minute film Stryker’s War starring Bruce Campbell and Sam Rami proper. Problem is unlike the feature, it is in standard def. which I found slightly disappointing. There is also a short interview with Campbell shot on the land he owns that looked like it was shot in standard def as well and it offered a lot of fun background info on his involvement with the picture. There is also a commentary track, a reversible cover and the usual Synapse goodies. While this will be a definite buy for the hard-core Evil Dead and Bruce Campbell collectors, I don’t know how many regular folks who will pick this up. While Thou Shalt Not Kill… Except is fun and looks and sounds great, its not a terribly good film even in the so bad its good way. However, the extras definitely make up for the shortcomings of the film and make it a much more attractive package for those on the fence and the price isn’t bad to boot at currently $19 on Amazon. I definitely suggest giving this one a Netflix if you haven’t seen it, before picking it up. But if you own more than one copy of The Evil Dead this is right up your alley and makes me wonder, when the hell will we get a copy of Within the Woods? 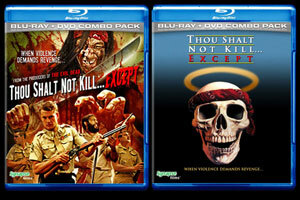 Thou Shall Not Kill… Except is now available on Blu-ray/DVD.